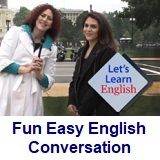 ﻿ Fun Easy English - new classroom free online classes english language lessons speaking listening writing reading january 21. 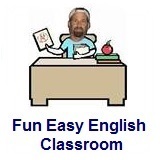 Today in the Fun Easy English classroom you will learn the way to describe activities. 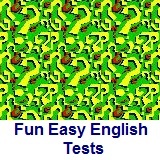 You will watch a video and take a test. Hi. In the classroom today you will learn the way to describe activities. In English, when describing participation in a particular activity, the following words GO, PLAY, and DO are typically used. Knowing which word to use with which activity is extremely important. Many English language students cannot match the correct word with the correct activity. For example you would say you are going to PLAY football and not go football or do football. You would say you are going to GO bowling and not play bowling or do bowling. You would say you are going to DO yoga and not play yoga or go yoga. Hey this is a very important lesson. The correct usage of GO, PLAY, and DO is important for casual conversations. Native English speakers will typically ask you about your hobbies. After studying this lesson you will be able to answer their questions correctly. This is a test to see if you know the way to describe activities. There are 50 questions. Good luck. Conversation Lesson 21 - Can You Come to the Party? In this lesson Anna meets her friend Marsha in a coffee shop. Marsha asks Anna to come to a party. But Anna has to take a driving test. Can Anna come to the party? Anna: We have to go. I have to help Marsha shop. And I have to practice my song! In this lesson, Marsha asks Anna to come to a party on Saturday. What do you like to do on the weekends? Write about what you plan to do next weekend. Write about it in the Facebook Comments section below. Use the Activity Sheet to practice talking about your talents and skills. Click lesson activity to get the printable PDF version. The page opens to a new window.